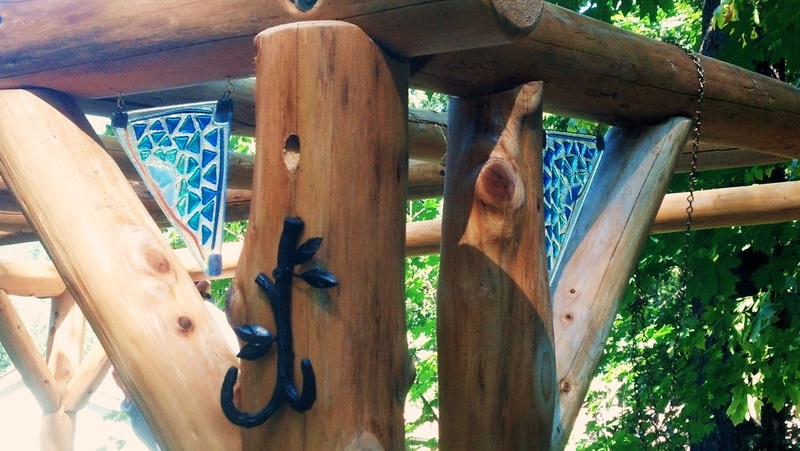 Whether for your home or garden, many of my creations can be customized to suit your needs. 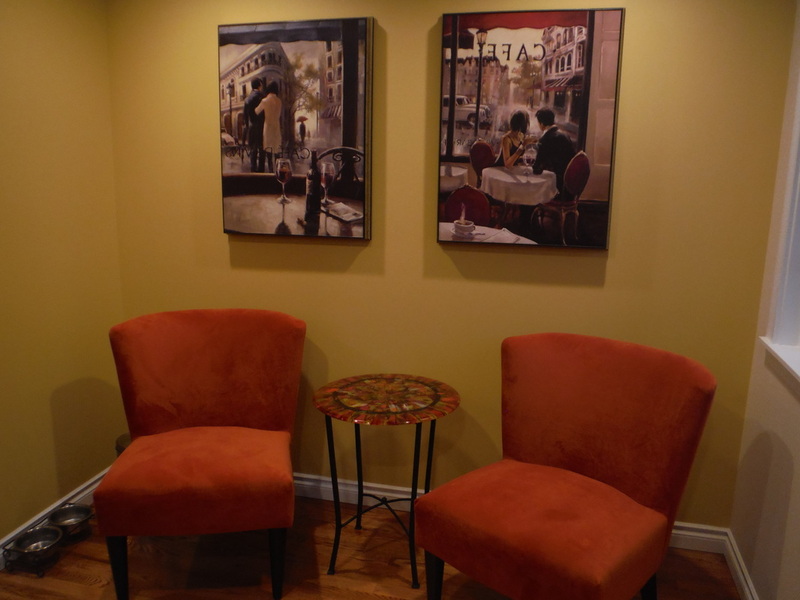 Please contact me directly to discuss your project and schedule your initial consultation. Here's a recent commission for a fused glass tile table top I named "Sunset Boulevard". The art deco-style wrought iron table base is a family heirloom, one of two which were custom-made in Las Vegas in the 1940s, the other belonged to actress Gloria Swanson. After meeting with my client to discuss color and design, I began by scheming my design with fused glass tiles that they choose from my collection. In particular they liked my copper leaf tiles, which are made by hand-cutting a thin sheet of copper to shape and then sandwiching the "leaf" between two pieces of glass. When fired together in a kiln, the glass fuses into a solid tile and the copper turns to rich shades of red and brown. I created five different tiles in all from a variety of glass for this table, designed to compliment the client's decor as well as the wrought iron base, and finished it with black grout. This Bellevue-native client had moved back recently after living a number of years in Arizona, wanted to replace their southwest, kokopelli-themed art, and needed a mirror for their dining room. 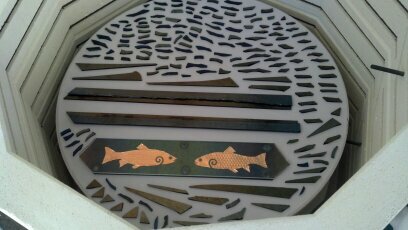 Embracing the feel of the Northwest with trees and fish and rich shades of green and brown, I began by creating a glass tile with two embossed copper fish, tree trunks and branches cut from iridescent bronze, and cast leaves in shades of green glass from a mold. Amber glass mosaic tiles and silver metal beads frame the scene which is accented with glass beads and finished with black grout. A focal point for this Snoqualmie valley kitchen, this wall panel was inspired by my client's colorful garden and is suspended from a wall-mounted metal bar. I hand pulled "strings" of yellow-orange glass for petals and used powdered glass to stencil a little salamander in the center of the sunflower. Irregular strips of green and amber glass layered randomly form the backdrop of this expressive landscape that sparkles in the afternoon sun. These suncatchers bring hints of color to this peeled log pergola, framing the view of Tatoosh Peak of this woodsy cabin near Packwood, Wa. Clear iridescent glass was cut to fit the angled corners and fused with a mosaic-like design of colored glass inspired by the surrounding mountains for a touch of all-season sparkle. My client's wish was for a small table for their newly remodeled kitchen. The solution: taking cues from their existing furniture and wall color as well as their new cabinets and granite counter, I designed this 20" round, fused glass slab table top. With layers of black-streaked and iridescent amber glass, interspersed with glass "confetti" in orange, yellow, deep red, and accents of bronze, I imagined gazing upon a puddle of water reflecting a canopy of blustery autumn leaves. After nearly 4 days in my kiln, the glass fuses into a solid, kaleidoscope of shimmering color that when paired with a simple metal base, perfectly completes this cozy seating area. Layers of iridescent, amber, and vanilla streaky glass fused together create shimmering tiles reminiscent of agates - a perfect compliment to my client's rustic, lakefront home. The large tiles on the top shelf are window-paned to accentuate their translucence. Combined in a mosaic of art glass, glittering mosaic tiles, and vanilla colored grout, a wrought iron aquarium stand is transformed into a uniquely elegant and functional console table.